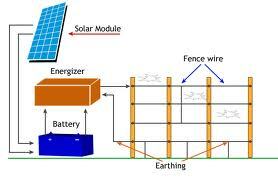 Non-Lethal Solar Powered Perimeter Security System. Operate as Psychological and Physical Barrier. The System will alert any kind of intrusion through an audio alarm system that can be in the vicinity of more than 500 meters, within a second. The Security Fence System will produce a high voltage at desired energy output, which will act as an active deterrent, a physical barrier and a reliable detection system. The Security Fence System produces a high voltage to deter, detect and deny physical intrusion by giving the intruder a short, sharp and painful shock.